Directions: Study the driver handbook before you take the test. Each question has three answer choices. Choose one answer and mark an X in the box across from the answer. Do not talk while taking the test, use any books or notes, or cell phone, or electronic devices, or leave the test area before your test has been graded. It may result in a test failure and you may be suspended or revoked. Be prepared to stop if the light is flashing. 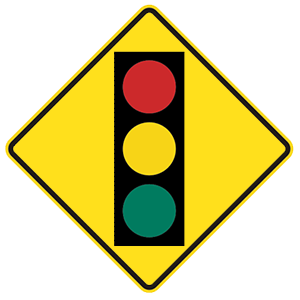 A yellow sign with a traffic signal pictured indicates that there is a traffic signal is ahead. Be prepared to respond to the upcoming traffic signal. The other side of the road is a solid line. Your side of the road is a broken line. The other side of the road is a broken line. Double yellow lines in the center of the road indicate that you may pass if a broken line is next to your driving lane. Under no circumstances because it is always legal. If the road or weather conditions require a slower speed. Only if you are approaching a sharp curve in the road. California has a "Basic Speed Law," which means that you may never drive faster than would be safe in current conditions. Even if your speed is slower than the posted limit, you may still be cited if you are going too fast for conditions. When deciding how quickly to drive, drivers should take multiple factors into account, such as the speed of surrounding vehicles, the condition of the road surface, the presence of bicyclists and pedestrians, and weather conditions. The road ahead has many curves. There is a sharp curve in the road ahead. The road ahead may be slippery. 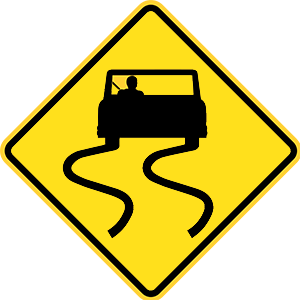 This sign indicates that the road ahead may be slippery when wet. Stay in the center lane. Move to the lane on your right. Move to the lane on your left. If a road has four or more lanes with two-way traffic, drive in the right lanes unless you are passing or turning left. If you are on an interstate highway and are driving below the speed of the flow of traffic, use the right lane. Come to a complete stop at the intersection. Slow down and proceed with caution. 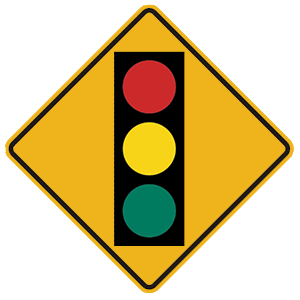 A traffic signal displaying a flashing yellow light indicates that you should be alert and proceed with caution. Slow down when approaching a flashing yellow traffic signal. May be crossed to enter or exit a private driveway. May not be crossed for any reason. Should be treated as a separate traffic lane. Two sets of solid double yellow lines spaced two or more feet apart are considered a barrier. You may not drive on or over this barrier, or make a left turn or U-turn across it, except at designated openings. Other drivers to merge onto the freeway. The truck driver to stop the vehicle. Other drivers when they want to slow down. Because they are larger, trucks take longer to stop than cars traveling at the same speed. Other drivers should not pull in front of a truck and then slow down or stop. This sign warns of of an approaching traffic signal.